You'll be £14.00 closer to your next £10.00 credit when you purchase Fight the Good Fight. What's this? Whilst a toxic mixture of nationalism and militarism tore Europe and the wider world apart from 1914 to 1919, there was one factor that united millions of people across all nations: that of a Christian faith. People interpreted this faith in many different ways. Soldiers marched off to war with ringing endorsements from bishops that they were fighting a Godly crusade, others preached in churches and tribunal hearings that war was fundamentally against the teachings of Christ. Whether Church of England or Nonconformist, Catholic or Presbyterian, German Lutheran or the American Church of Christ in Christian Union, men and women across the globe conceptualised their war through the prism of their belief in a Christian God. This book brings together twenty-three individual and family case studies, some of well-known personalities, others whose story has become neglected through the decades. Although divided by nation, social class, political outlook and denomination, they were united in their desire to Fight the Good Fight. John Broom wants to "keep alive the thoughts, feelings and beliefs of people a century on and to appreciate the moral and spiritual strength of a generation of people from all walks of life thrust into a world of new and frightening challenges." Some of the photographs that illustrate the book are as thought provoking as the text. With the news this week that non-believers outnumber believers in Britain for the first time, it's time to reflect on what's happened, starting with faith in the first world war. There is little doubt that the vast majority of British volunteers and concscripts believed in a God, and were promised by the powers that be that God was on our side. John Broom looks at such beliefs during the first world war - the tommies were always fighting for God, the king and their country - so much has changed in a hundred years... A fascinating study. 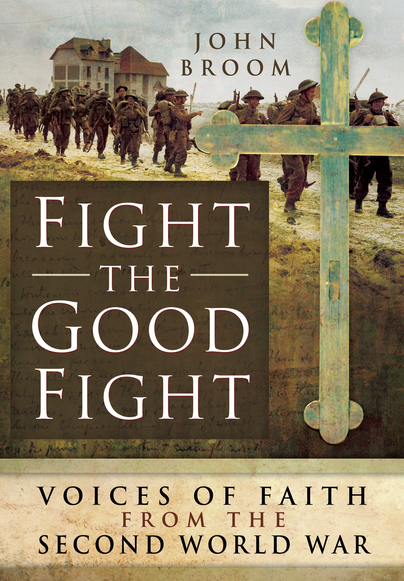 “Fight the Good Fight - Voices of Faith from the First World War” presents a selection of diverse experiences of the Great War from devout individuals, from the Home Front to the fighting front, from soldiers and chaplains, to women and conscientious objectors. Each individual has their own story and perception of the war in relation to their particular brand of Christianity, whether they were pacifists or seeking to justify the cause through similarities set out in the Bible. John Broom's choice of title is apt with a clear religious undertone, and one that after reading the book can be interpreted in many ways, not just literally. Each of his chosen case study stands out unique, and from his excellent narrative their universal devotion to their belief and their dedication to those less fortunate is clearly outlined. The added inclusion of four case studies from other countries also adds weight to the book's content. Printed in hardback with an attractive yet poignant dust cover, the book is a good overall thickness and weight, which fits in with many other titles from the publisher as well as being a practical size to read. The contents have been logically arranged with the body of the text preceded by a Foreword and Introduction, and proceeded by a conclusion chapter, with an interesting central image section which places a face to the various case studies. Furthermore each chapter is a unique case study and has been arranged similarly, focusing on their "calling", while also giving a brief background of the person in question, as well as their subsequent fates and legacies. This not only adds consistency to the text but aids in comparing the various case studies. An extensive Appendix section which includes Notes, Further Reading and an Index, allows easier referencing and excellent avenues for further research and reading. The book is clearly well researched and tackles a difficult but relevant topic; the relationship between war and religion, and the Christian attitudes to fighting evil and ultimately taking another's life. The author is more than qualified on the subject, having previously written articles for the Bible Society, while much of the research is based around letters, diaries and biographies. "Fight the Good Fight" gives an all-round view of how the First World War was interpreted religiously and it's affect on a broad spectrum of individuals, not merely those included in the text but those that were touched by them. The underlying aspects of the war are seldom explored, yet this theme in particular is one that held heavy significance in the daily lives of those fighting the war both at home and abroad, and as such this book gives a unique and valuable insight into attitudes which are somewhat harder to relate to a century later, as Christian belief was in essence the backbone of British society and oblivious to social class, gender or organization. I especially enjoyed the case study of Louise Thuliez which focuses around helping escaping soldiers from the Germans, which is a theme more associated with the Second World War, and has sparked my interest to inform myself more on this. 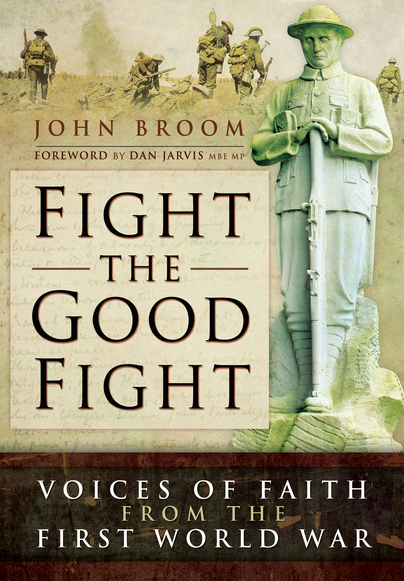 Regardless of your belief or indifference to religion John Broom's book is an interesting and informative read, and a valuable study of social, military and indeed religious history. A well-produced book with a thoughtful foreword by Dan Jarvis, the Labour MP for Barnsley, who acted as that party's spokesperson on the commemoration of World War One. John Broom’s recently published book addresses a topic that has been surprisingly neglected over the years. It has been more or less taken for granted that people ‘back then’ were more religious. This myth is examined and put in to a clearer context by the author as he explores how a specifically Christian faith had an inspirational and transformative effect on the lives on many people at the time. The method he pursues most effectively is to look at individual case studies and it is necessary as this juncture to declare a personal interest. The story of my own grandfather, Joseph Garvey, is given one of the 23 chapters. I feel privileged to be in a position to comment as the family has always been immensely proud of both his enduring faith and his contribution to the war. Where the book works particularly well is in its structuring, its sympathetic look at the personal faith of each individual and in its readability. Regarding its structure, the 23 chapters are subdivided into 6 self-explanatory groups; Christian Britain in 1914, Three Chaplains and an Army Scripture Reader, Women in War, Christians from Other Nations, Conscientious Objection in the First World War, Familes at War. Famous names like the nurse Edith Cavell, Alvin (Sergeant) York and double V.C. winner Noel Chavasse mix with people few will have heard of before, all of them being united by their Christian fellowship. I learned much from reading Fight the Good Fight and daresay many others will, too, both committed Christians and those of little or no faith who are seeking a better understanding of the Great War and its participants. John Broom’s book explains the aspect of religion during the first world war, in short stories about people who gained, advanced or lost their religious beliefs during that conflict. It is easy to read and understand, and provides a balanced view of the subject in that era. An excellent and thought provoking book, well worth the read. Fight the Good Fight is an extremely readable book, excellently researched, well illustrated with 23 plates, and packed with notes and references for anyone who wishes to take study further. It addresses a subject that has been largely overlooked thus far into the Great War Centenary, namely the importance of Christianity during the conflict. John Broom graduated in History from the University of Sheffield in 1991 and has pursued a career in teaching, firstly in History, and latterly as a Specialist Teacher in Autism. The inheritance in 2006 of 170 letters written by his late father between 1940 and 1946 sparked a passion to discover the links between twentieth-century warfare and religion. After completing an MA in Local and Regional History with the Open University, he is currently studying for a PhD at the University of Birmingham and has conducted research on behalf of the Bible Society for their First World War website. John maintains an active social media presence on Twitter at @johnbroom1970 and blogs frequently at www.faithinwartime.wordpress.com.